With the parting of the red curtain last week at City Center, The New York City Opera returned home from its long exile to Lincoln Center and other venues. The music to Rossini’s MOSES IN EGYPT is lovely, and among the performers Sian Davies as Elcia and Wayne Tiggs as Pharoah made a particularly strong impression. It is in many respect a fascinating work on its own terms and this multimedia production made it all the more so. 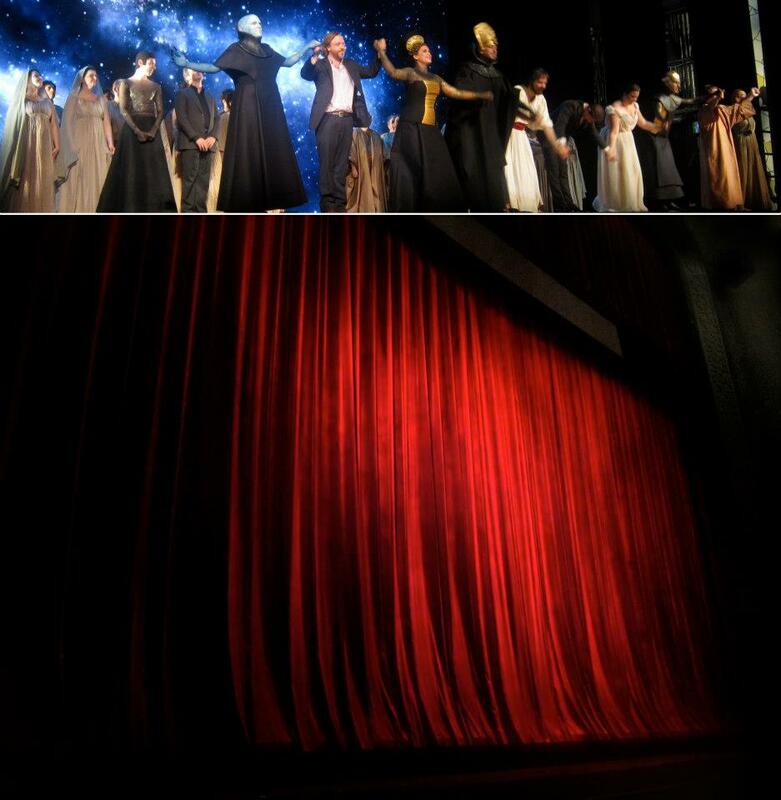 The greatest innovation in the staging was the use of digital videography to create the illusion of moving through space, in exquisite pace with the score, and also, from time to time, to propound an abstract geometrical frame for the biblical figures and the landscapes that surround them. The contribution of Jessica Jahn’s costumes to this effect was notable, if double-edged, reminiscent in equal parts of the Bauhaus ballets of Oskar Schlemmer, figures depicted in books with names like “Bible Stories for Children,” and, particularly as regards Pharoah and his minions, the fashion choices of the most fascistic aliens in FLASH GORDON or STAR TREK. That such associations crossed one’s mind was doubtless unintentional, and a little problematic, but revealing of the production’s central irony, which was that although the music and imagery held me in rapture, it brought neither me nor an evidently pleased audience to our feet. The libretto depicts a rivalry amongst gods, the Judeo-Christian and the pagan, prosecuted under a merciless Mediterranean sky, so it is unsurprising that the dramatic effect was, at its best, akin to Greek tragedy. But since the epic is biblical, neither artist nor audience had the freedom to fully embrace the presented reality that a universal acceptance of the fictitiousness of the Greek deities ironically allows. There are believers and unbelievers amongst us, and so the cosmic significance of the events depicted was subtly but palpably evaded, neither wholeheartedly accepted nor provocatively challenged. It is not simply a problem of depicting stage figures who either believe or do not believe (as can be done in naturalism), but of portraying a universe that is itself posited as divine. The alternation between videographic abstraction and world-making took a step towards resolving this dilemma, but fell short of compensating for the lack of tragic commitment that historical reality has imposed on the material.